Trends, by definition, come and go as they please, and according to this 54-year-old fashion girl, there are a few that are better off left alone as we enter 2019. Over the years, Grece Ghanem has worked her way up from influencer to style icon, so it was no wonder I was thirsty to seek her advice on the trends for the year ahead. "As a 54-year-old fashionista, I have seen a lot of trends come and go; every year some fade away yet never go fully extinct," said Ghanem. "For 2019, I am saying au revoir, mais pas un adieu, to some trends and happily welcoming new ones," she continued. In addition to the laundry list of trends she will be ditching this year, Grece also enlightened us on the trends she will be investing in. Curious to see which 2019 styles made the cut? Go on to read this 54-year-old's take on this year's biggest trends—both the good and the bad. "Goodbye to miniskirts and flat ballerinas. You will also see me sport [fewer] ruffles and all-sheer looks. I am highlighting a more modern silhouette in 2019. I am ready to hang my oversize, padded jackets with the strong shoulders and adopt a softer figure for the New Year." "Give me 50 shades of beige! Head-to-toe or blended with dreamy pastel shades. I am also a fan of bold colors, even welcoming neon pieces into my wardrobe." 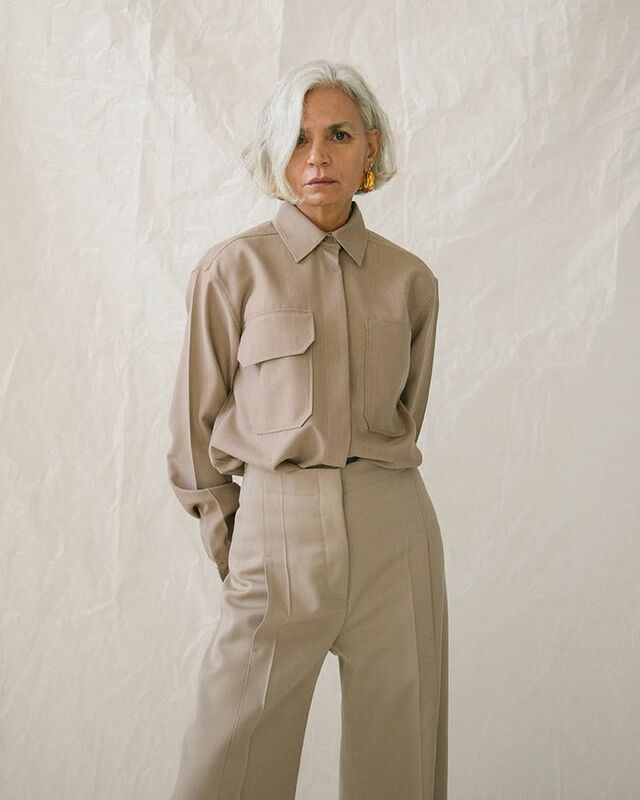 "Boilersuits and cargo pants for utility-chic dressing—both practical and trendy." "Suits, suits, and more suits; keeping in mind I will adopt a more fluid silhouette and fresh tailoring." "The not-so-basic basic hoops or long earrings to add some dazzle to every outfit."